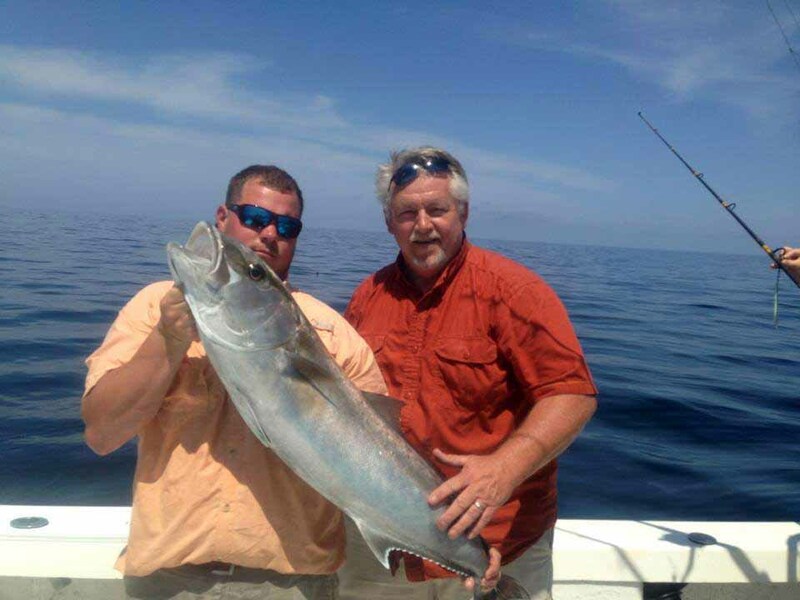 Jason Ogden with a fine cobia, caught fishing with Sea Hag’s Derek Snyder. 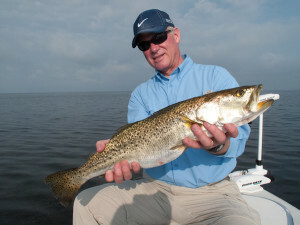 Gil Meredith III with a fine trout caught on a topwater plug. 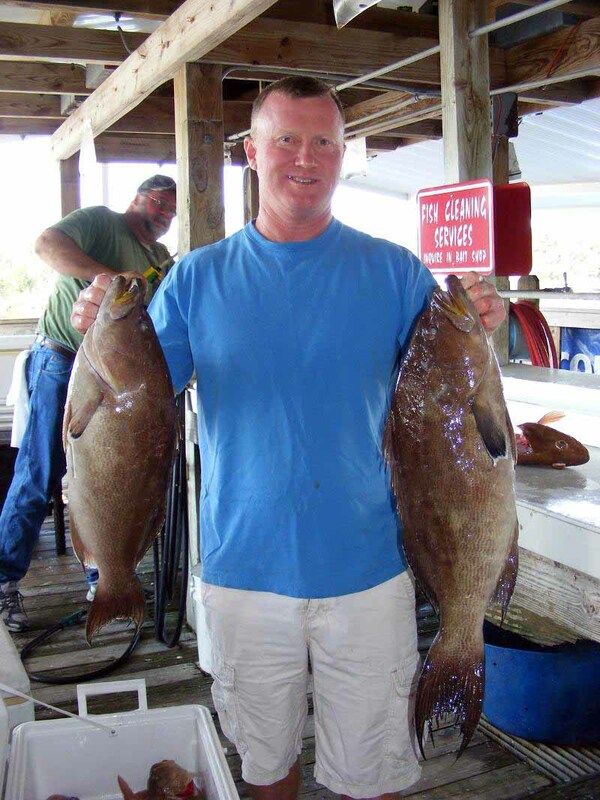 Frank Sheffield with a pair of excellent scamp grouper from a middle grounds trip. 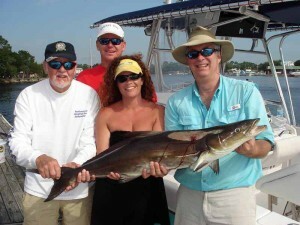 Amanda Wilson and friends from Valdosta brought this nice cobia to the cleaning tables. Dave Schleissing and Bob Cousins found these amberjack on some offshore structure. Cam and Dawson Maxwell caught this fine trout/flounder combo fishing from a Sea Hag rental boat. Bill McDavid trolled up this nice kingfish fishing off of Pepperfish Keys in 20 feet of water. 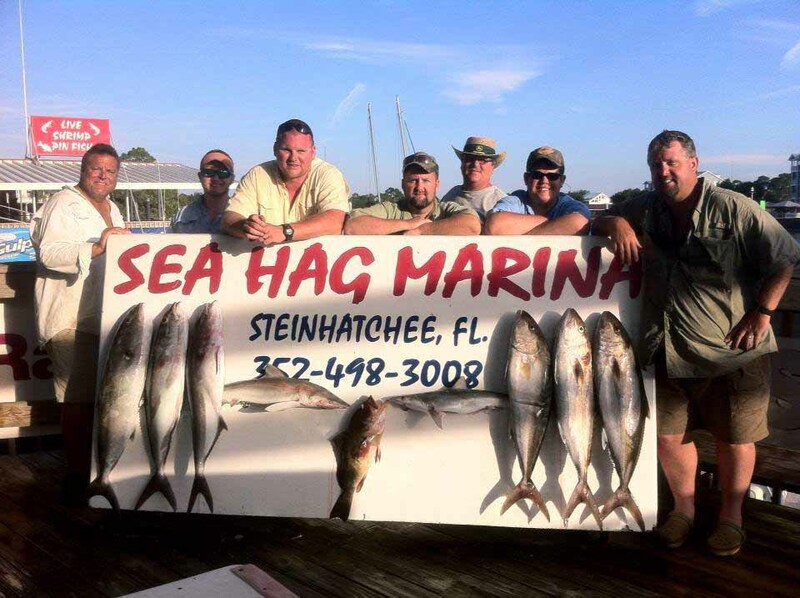 Trevor Bass and his group found this great mixed bag of red grouper, amberjack and red grouper along with a monster kingfish. 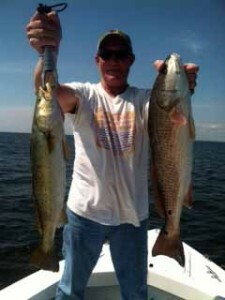 Marshall Adams and Don Milleman found these redfish fishing with me south of the river. 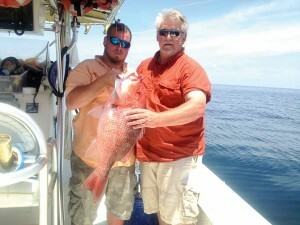 Offshore, the excitement involves the opening of red snapper season on June 1. If you’re interested in catching these fine eating fish, you need to plan now. Many captains are heavily booked in advance for this season, and even accommodations are getting difficult to find. So many red snapper have been caught and released that everyone is expecting a banner season, but it’s a short one: just one month long. Kingfish will be showing up in increasing numbers, following bait pods. 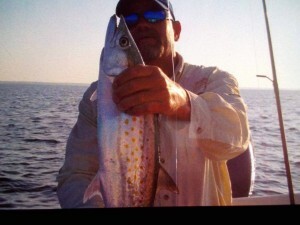 Troll spoons or duster rigs to pick up both kings and Spanish mackerel. 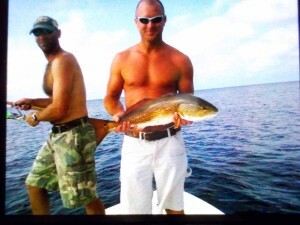 When bottom fishing in water over 15 feet, always put out a free-lined live bait and you will get some blazing action. Unfortunately, amberjack are closed for the months of June and July. At the end of the snapper season, gag grouper will open in federal waters, so plan ahead for a great offshore trip. 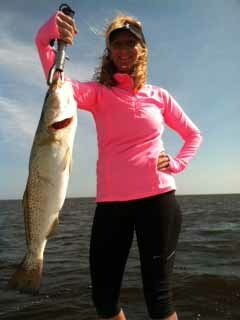 Inshore, the trout season will continue to be one of the best in recent memory. 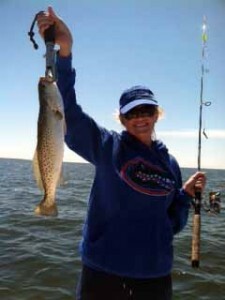 Trout are hanging in relatively shallow water this year. 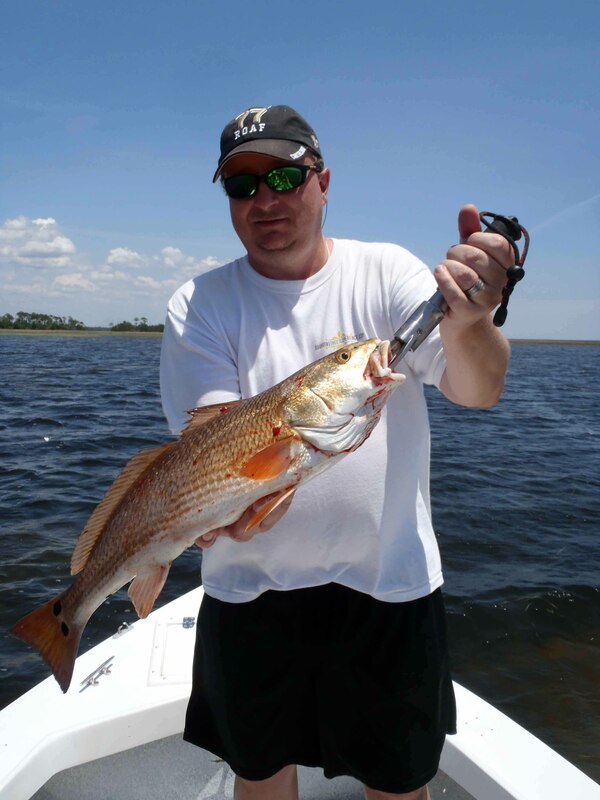 Fish over spotty bottom in 3 to 5 feet of water with cork rigs and live shrimp, artificial shrimp such as Gulp or DOA lures, or fish early with topwater plugs. 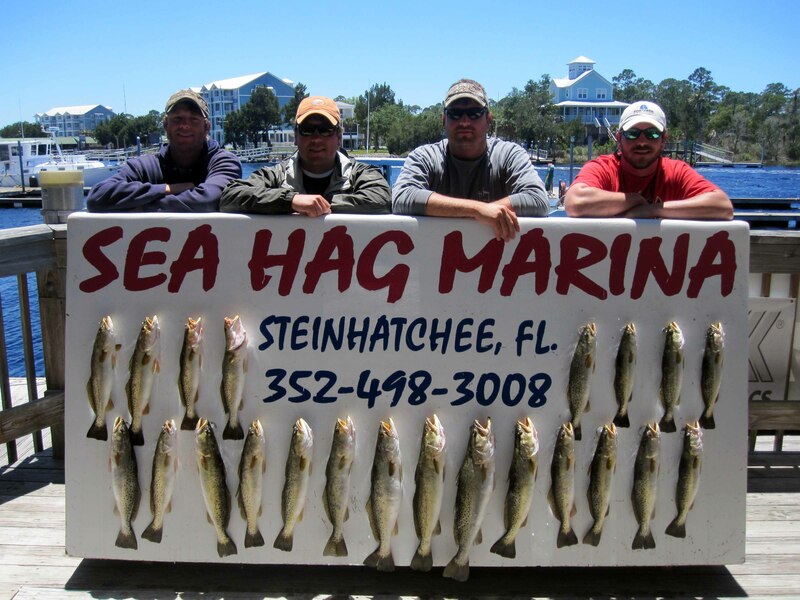 We’ve caught several five pound fish and some over 6 pounds have been taken near the end of the month. 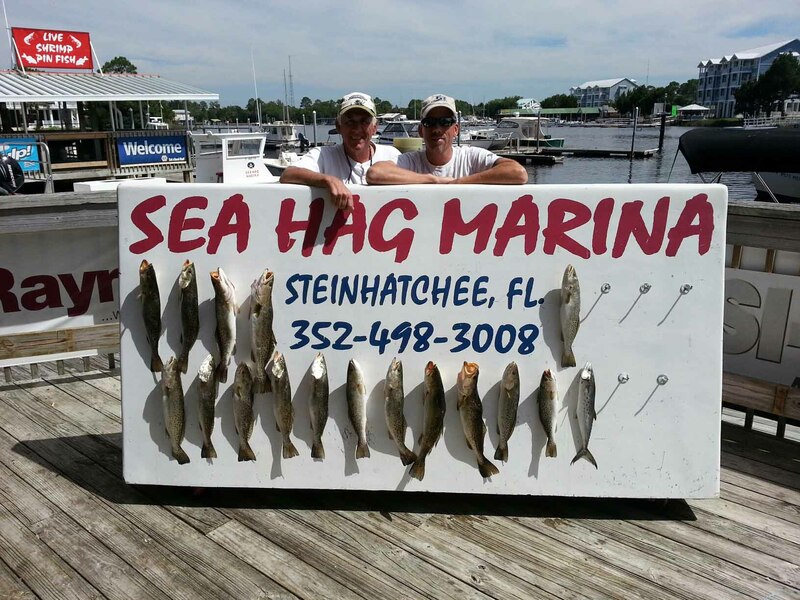 Some consistent fish are being caught around the Bird Rack to the north and outside of Pepperfish Keys to the south. Redfish are schooling but also hanging in shallow water in singles and pairs. 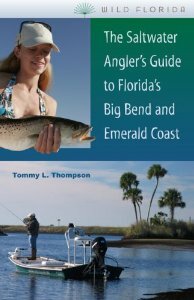 Work your way in close to shore with topwater plugs or jigs, and fish shorelines on flooded tides with jigs, live shrimp or pinfish, or cut bait. Try north of Big Grass Island to the north, Bull Cove and the Sink Creek area and behind Pepperfish Keys around Stewart Point to the south. 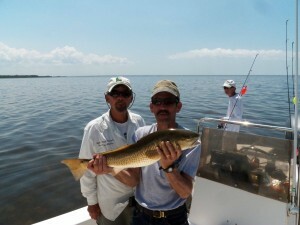 On flood tides the redfish will move back and forth along the shoreline, sometimes getting into the grass. We will be seeing more and more floating grass so when you want to fish artificials, keep a gold spoon rigged and work it slowly through the grass. An alternative is a Texas-rigged jerkbait, rigged weedless. Jigs are also useful in grassy water but expect to be clearing a lot of grass off your hook. When you can use lures, we’ve been having great luck with Heddon Superspook Juniors, Rapala Skitterwalks, Mirrolure Mirrodines and Mirrominnows, and the Sebile group of lures. 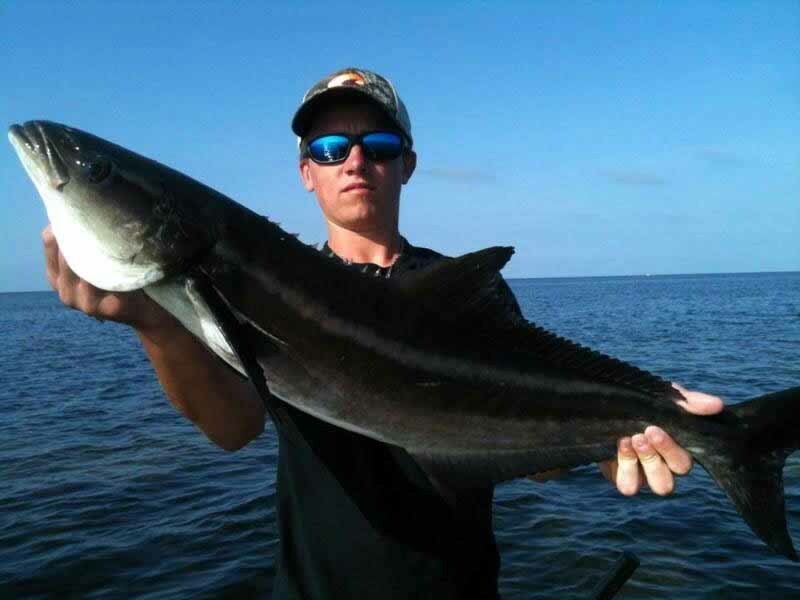 Keep an eye out for cobia cruising the flats; I’ve seen some 30 pounders pushing a lot of water, especially in the Tater Island area. 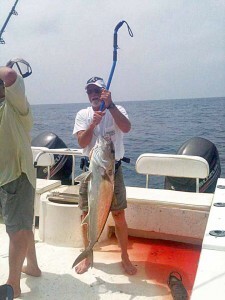 I’ve taken to keeping a cobia rod available and accessible on every trip. Gulp is now making a 10 inch eel, available in the Ship’s Store, which is a deadly cobia bait if you can get it anywhere near them. 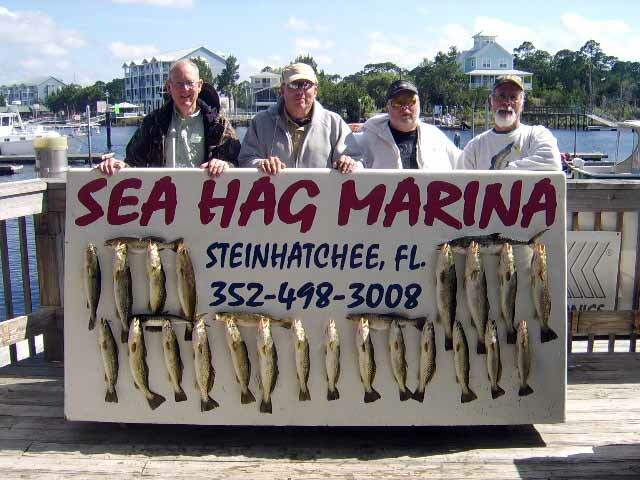 It will be an epic month of fishing, so stop by and pick up any needed tackle at the marina, and remember that we have live shrimp and pinfish. And in terms of coming attractions, we’ve been seeing scallops in shallow water, getting ready for the biggest event in Steinhatchee- scallop season. Make sure you’ve got your accommodations reserved well in advance of the July opening. 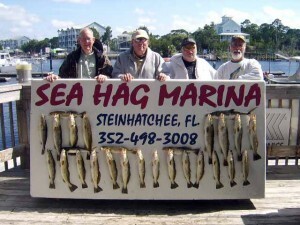 It should be a great summer at the Sea Hag. The bite this month has been excellent. 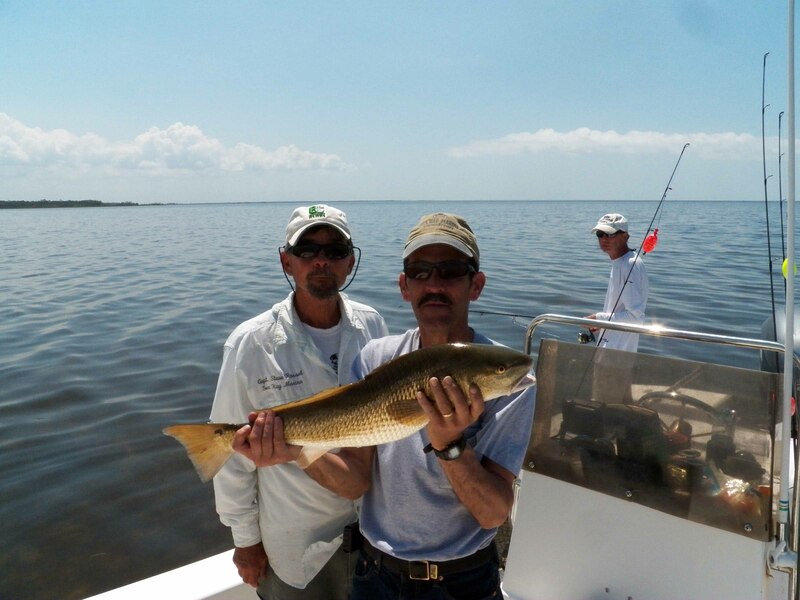 We have been routinely enjoying limits of reds and trout … sometimes both … and as the end of the month arrived the fishing just seemed to get better and better. I’m counting on June being once again an excellent time to fill the cooler. A wealth of trout are being taken in skinny water leveraging float rigs … make sure your leader keeps your bait above the surface of the grass in the skinny water for more strikes. Gulp baits of just about every variety are keeping their interest. Lighter colors have been attracting more attention when the waters are turbid as expected. 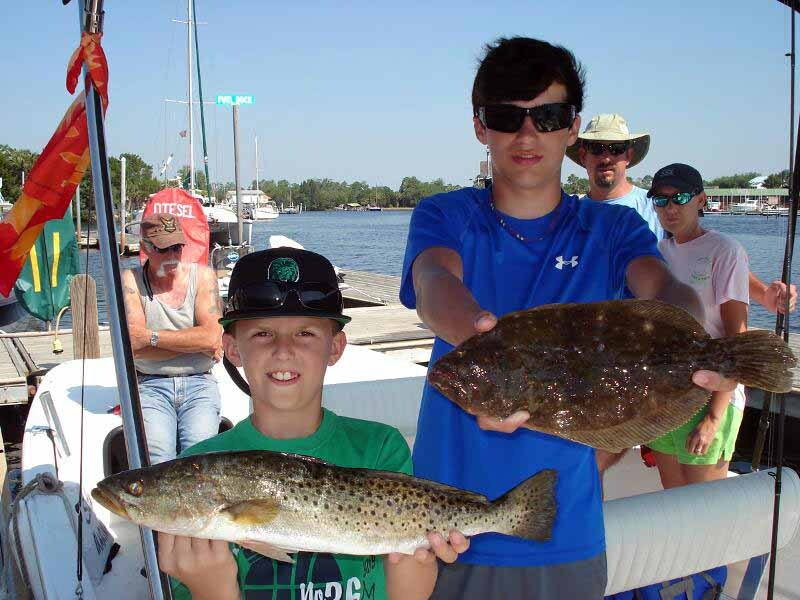 School is nearly out for most students … now is a great time to pick a weekday and share nature and the fishing action with young anglers. Give us a call … plenty of great dates in June are still available. 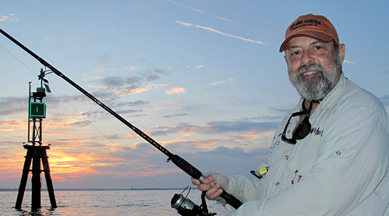 Let’s face it, we have a month before scallop season begins and fishing takes a back burner. 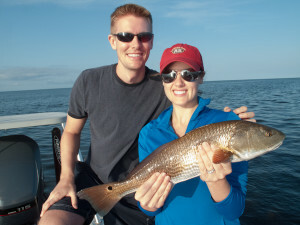 Don’t forget … Hooked on Reds Charters is available for scallop trips beginning July 1st. !!! 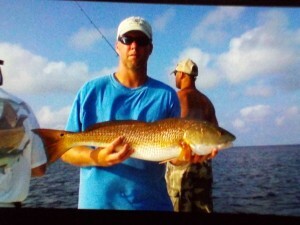 June looks to be another great month for fishing on the flats. 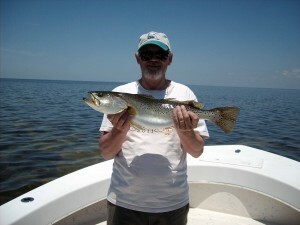 Plenty of nice trout to be caught and there are still schools of redfish roaming the shallows. I still have some days open for charter or if you prefer you can always rent a boat for a few dollars less. 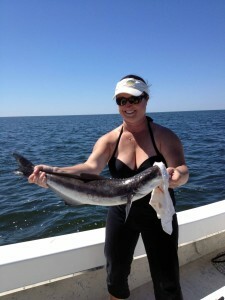 Catching a few cobia with most being too short but a few over 20 lbs. are being taken. 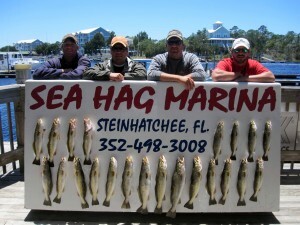 Lots of fun on light tackle and they are great on the grill. 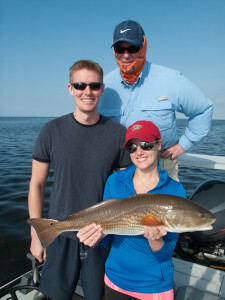 Had the Brooks party out a few days back and both Leanne and Amy landed nice cobias with Amy’s being 30 lbs. Lots of Spanish still around the sand bars and a few keeper sea bass on the deeper flats. I’ve been fishing for a while, I just got off the boat and showered; I’m tired so I’m going to put the current happenings and June prognostication in a nutshell. Amberjack fishing has been off-the-chain. The average reef-donkey has been averaged 25lb, with half or more running over 30lbs and a couple of 37+pounders have been hauled over the gunnels. For here, in the Big Bend, that is a quality fish. Besides, I don’t want to battle much larger AJ’s. 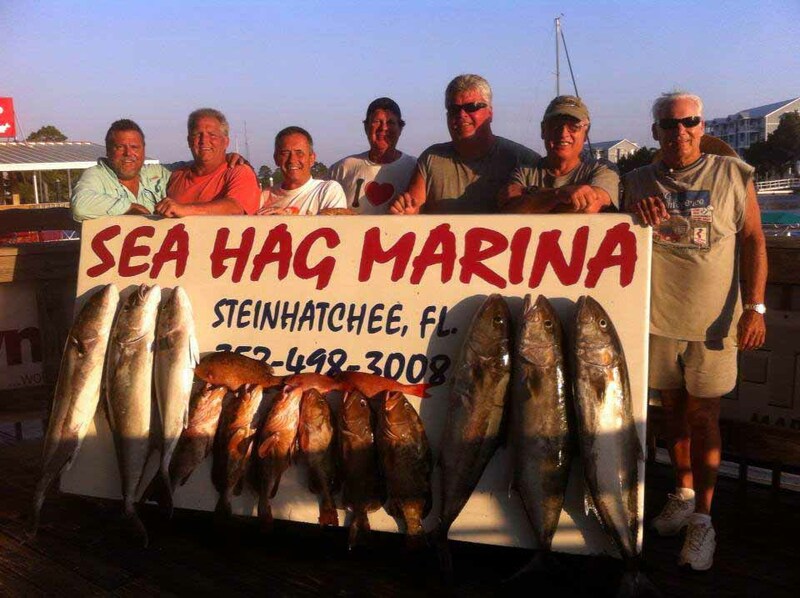 However, on June 1st the feds are going to shut down amberjack fishing for recreational anglers, for no biological reason. I’m stupid enough to think the fishing regulation should be based on a particular fishery, not politics. Amberjack are closed from the first of June through the end of July. Red grouper have been difficult to come by recently. The slick calm conditions have shut down the bite. It’s not just me. According to Shane, Sea Hag’s fish-cleaner-extraordinaire, very few red grouper have been seen at the fish cleaning tables. 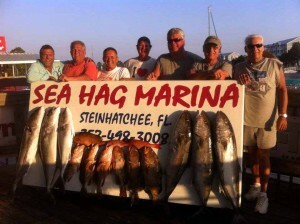 I’m sure if we can get a bump on the water, the grouper fishing will improve dramatically. 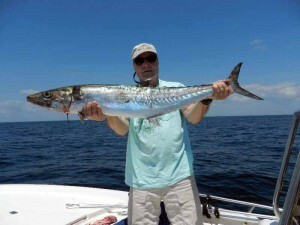 Spanish mackerel are abundant in waters 20-32’. Flashy jigs and spoons are the Latin ticket. The fish we’ve been picking up aren’t the thin razor Spanish of the spring, but good 2-3# fish. Cooler water temperatures (74F), I suppose, have held the kingfish south. The Spanish are here, as well as the bait pods, yet the kings haven’t showed up in mass. June should be the D-day, however. 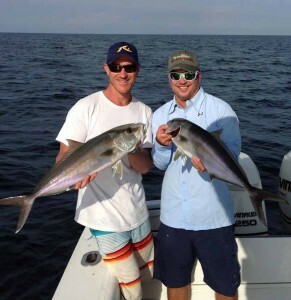 Cobia are cruising the flats. Big cobia! They have been ghosting the offshore haunts. I keep pitching good baits and praying for my favorite fish, cobia. June should be a great time to hook-up a memory maker. 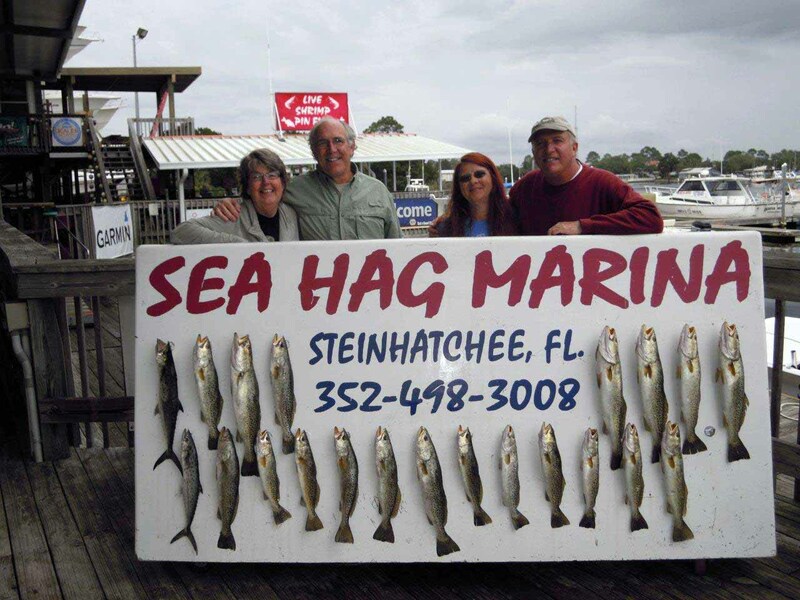 Don’t miss any opportunity to get out on the shallow waters near Steinhatchee. 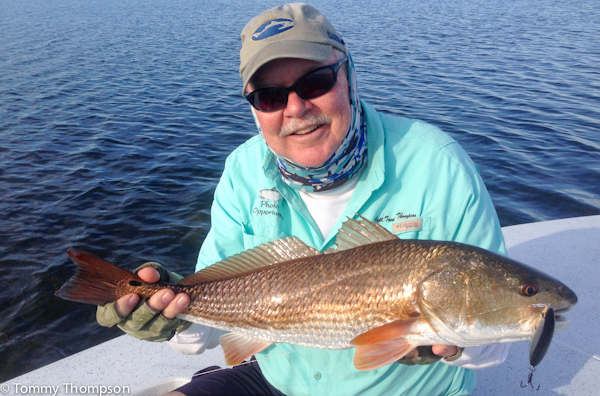 Big seatrout and reds are cruising the coastline, just looking for tasty mullet, pinfish and shrimp–and the myriad of hard and soft plastics that mimic them. I’ve had my best luck in waters that are as shallow as one foot, using topwater lures like Rapala Skitterwalks and Heddon’s Super Spooks. 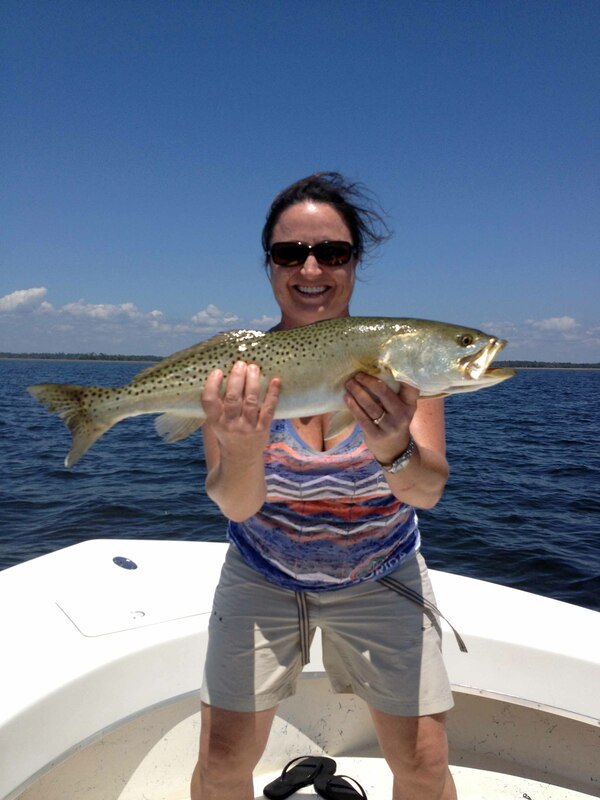 There are also plenty of keeper/eater sized trout on the flats in 4 to 6-feet of water. There, try free-lining a D.O.A. 3-inch “glow” shrimp, moving it very slowly across the tops of the grass and along the edges of white sand holes. As the Big Bend waters heat up, temperature-wise, expect to find more and more floating grass, making topwater angling almost impossible. A solution to that problem is a Texas-rigged D.O.A. Airhead bait. I use a 5/0 Eagle Claw wide gap hook and add a D.O.A. pinch weight if I need to make longer casts. I was particularly proud of young Emily Minton Beardley this past month. Emily has fished with me several times over the past few years, along with her dad, Buzz Minton, from Eau Claire, Wisconsin. Emily had a tough first day but proved her expertise on day two with 3 consecutive reds, all over 6 pounds, on 10-pound tackle, using a Rapala Skitterwalk. 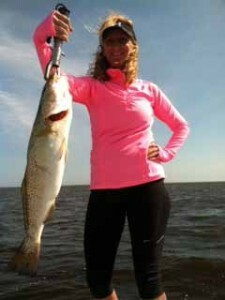 She outfished both her new husband, Grant and her dad that day. 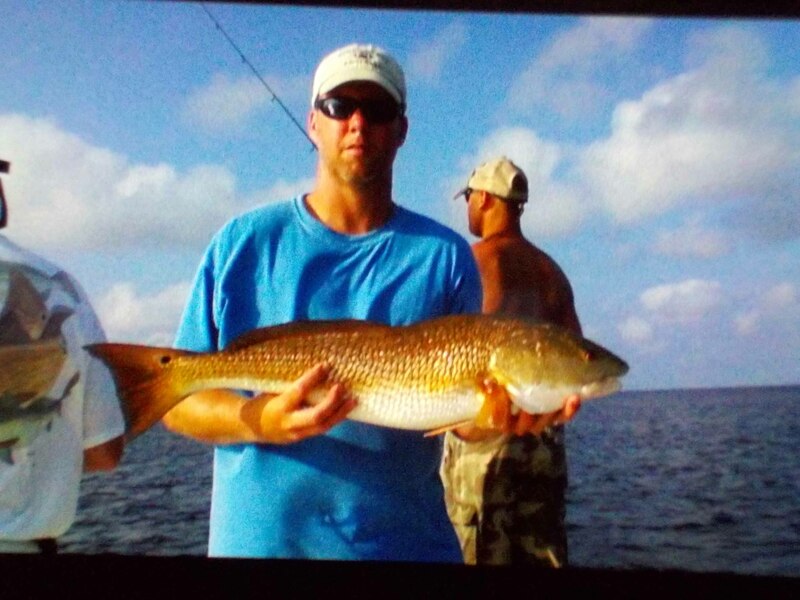 He biggest fish was an 8.5-pound “tournament winner” fish. I wish she was here to fish the Doug Johnson Reeling For Kids Tournament this month, as she’s turned into a great angler! 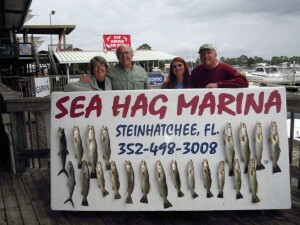 June is a wonderful month for fishing in Steinhatchee. All of those red snapper we have been catching and releasing are now eligible for harvest under the ever watchful eye of big government. As the snapper population becomes more abundant and larger, Gulf anglers are rewarded for years of conservation efforts by the shortest season ever. As part of their rationale, the Feds say that snapper are easier to catch and the quota will be met faster. While the population of these fish has exploded, the quota for recreational fishermen has not increased in anything approaching a relative amount. Red snapper are aggressive feeders and will take cut and live baits. 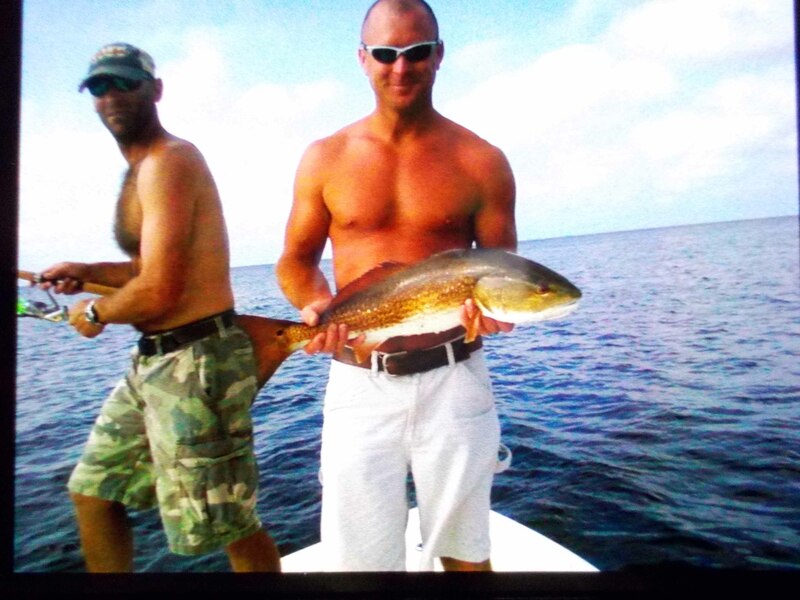 One of my favorite methods is chumming them to the surface and fishing light tackle…although this can be difficult given the lack of respect from other fishermen that seems to be the norm these days. AJs unfortunately go out of season for a couple of months and gags open on July 1…so June is officially designated red snapper month. 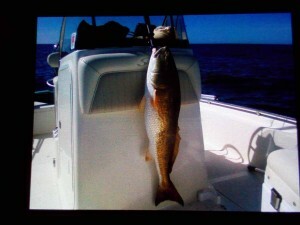 Red grouper got moved offshore by last year’s storms and fresh water runoff and remain more elusive than usual. As the water warms, cobia will leave the shallows and haunt structure in deeper water. A live eel is the best bait ever for the finicky ling. 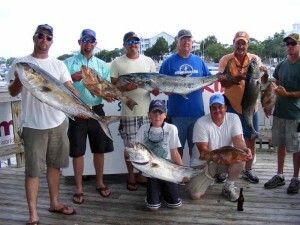 Kingfish are back and can be found from the short reef out to the deep. Try trolling a couple of dusters between spots for a smoker king and a fight to remember. 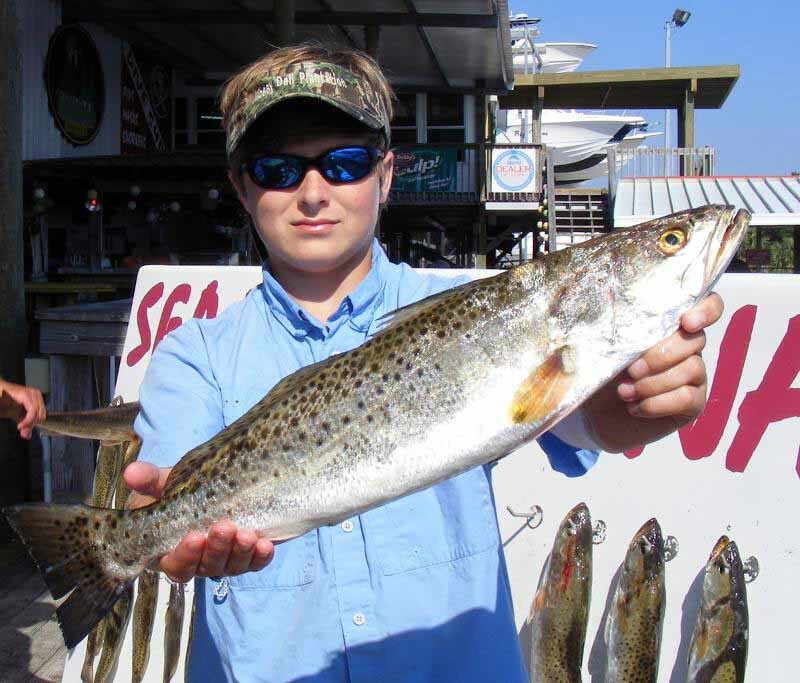 If you’re ready to try your hand at some tournament fishing, the Reeling for Kids Tourney begins with a Kickoff Party at the Touchdown Terrace on Thursday, May 30th. Captain’s Meetings are June 4th in Gainesville at CPPI, Inc, and Thursday the 6th in Steinhatchee at Roy’s. 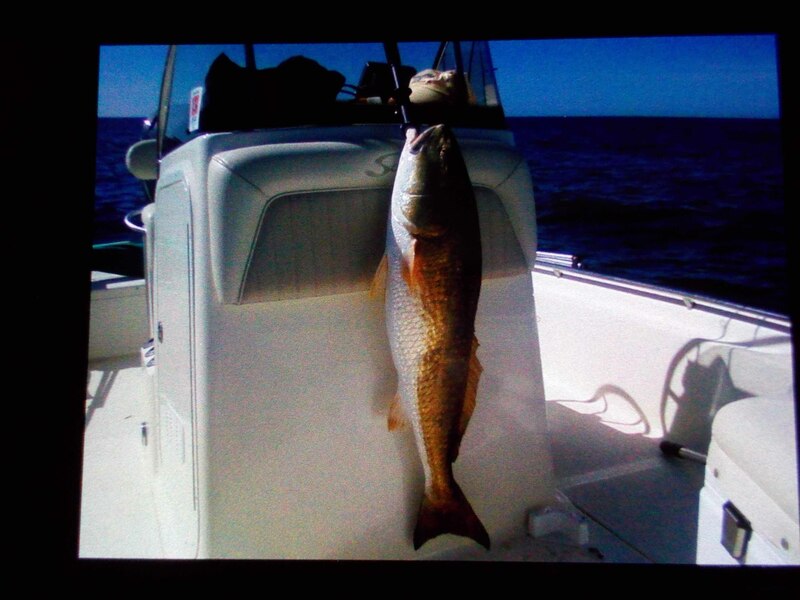 Fishing days are Friday the 7th and Saturday the 8th. This is a family oriented event, not to mention a ton of fun, and all proceeds go to support the Boys and Girls Club. Hope to see you there. 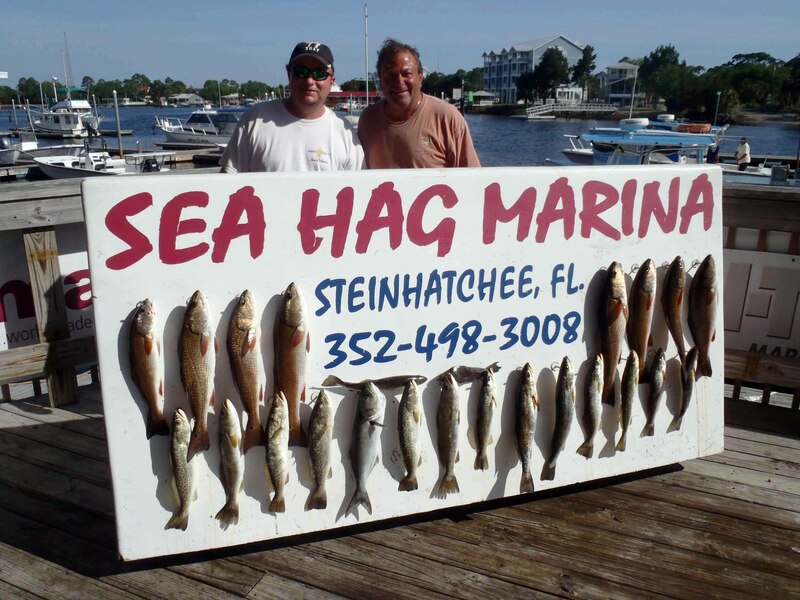 The month of May has been spectacular for fishing in Steinhatchee! 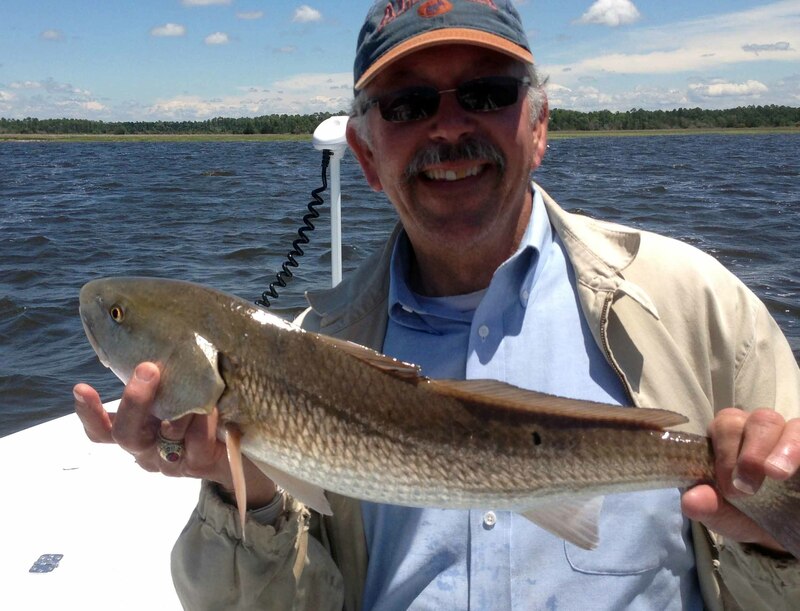 I have caught trout in 1 ft of water to 8 ft. Redfish are a little more cooperative and will only get better as the water warms. Baitfish abound on the flats with everything that swims answering the dinner bell. 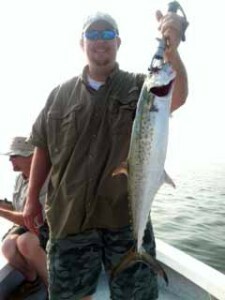 Spanish mackerel this year are on the large size, some weighing up to 6 lbs. 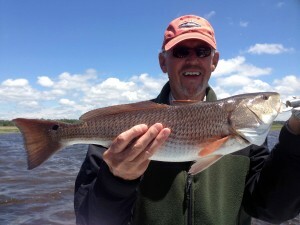 June promises to be good too due to the water temp being cooler and should extend the easy bite through the month . Best of luck to you , tight lines and good fishing.